This is a specialty! Lots of potential for bids that are too low because of the inexperienced contractors not anticipating what I, will probably be aware of immediately. Also, understand that most of the contractors out there tell you what you want to hear. I can and will tell you what needs to be done and if it makes sense to repair or go from scratch. Hint, 75% of the time it's the later. 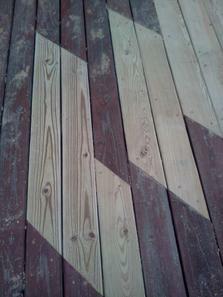 Replacement of some or all of the decking. Replace your railing with a sturdily designed one. Sunken decks. 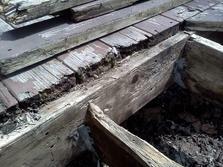 We can jack 'em up and make new "foundations"
Swap your poorly built and wobbly staircase. Enclose the bottom of that animal sanctuary. Lattice or solid material. Increase the size of the too small deck or shrink that monstrosity. Have another idea not here? Call or email. Everybody wants to keep their existing deck frame. "It's just fine!"